Welcome to a special Through the Lens blog post for NAB 2018. If you’re involved with live production, especially in North America, you know April is synonymous with the NAB’s annual flagship trade show in Las Vegas. Here’s a snapshot of what Ross is up to this week at NAB 2018. Navigating NAB can be difficult, but with this map, you can always find Ross Video! This year please visit us at our new South Lower Hall location at booth SL3305. If you are attending NAB this year, we hope you will swing by the Ross booth. We will be happy to share our latest product innovations, perspectives on what the future has in store for live production, or just exchange simple hello’s! No matter the reason for your visit, Ross promises to have some of the most exciting products on display. You can find us at booth SL3305 in our new South Lower Hall location. Ross’ CEO, David Ross, unveils the new Ultrix IP board during Ross Video’s keynote event to kick off NAB 2018. 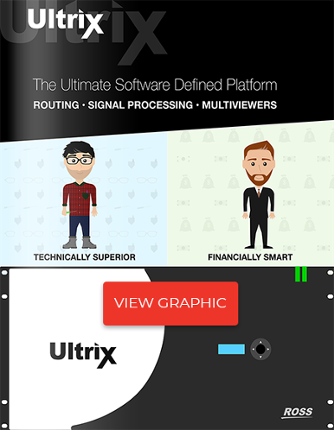 Ultrix IP – A new version of the latest Ultrix-FR5 routing/AV processing platform that adds IP I/O to the already impressive feature set of this disruptive, ‘Swiss Army knife’ infrastructure solution. The Ultrix-FR5 platform condenses up to 5 racks of infrastructure into a compact 5 RU 144x144 footprint that delivers enormous cost, space and power efficiencies. Ultrix is also software defined – meaning customers only buy the functionality they need when they need it, with new or added functionality enabled by software license which also saves critical time especially in the field. Carbonite Mosaic – Ross’ new multi-screen image processor built on the Carbonite Black Plus engine. Carbonite Mosaic provides the high resolution and layering capability needed to create the epic large screen imagery demanded by today’s top venues. Carbonite Mosaic reinforces Ross as the vendor of choice for live entertainment and sports venues looking to drive massive pixel-accurate displays. Check out this video of the Adelaide Oval stretching its new Ross legs with XPression Tessera to put on an incredible show! OverDrive+Graphite – the perfect marriage of OverDrive and Graphite. Enjoy the operational benefits of OverDrive’s production automation – greater consistency and higher quality – and the production power of Graphite (which features a real Carbonite production switcher, a real XPression graphics and a 28-channel audio engine all in one compact chassis). Streamline.Cloud – Ross has reproduced all of the power of Streamline Enterprise to create the first MOS-enabled, asset management system in the cloud. Available by monthly subscription, Streamline.Cloud integrates fully with the rest of the Ross news ecosystem, including Inception.Cloud for a complete cloud-based news editorial system. Find everything Ross at NAB 2018, including a recording of the full keynote event, here. If I may, I would like to end this post on a bittersweet note. It was announced during Ross’ Sunday evening keynote presentation that Eric Goodmurphy, a veteran of both Ross Video and the live production industry, will be retiring this year. Eric has been with Ross for 22 years including his most current role as Vice President of Infrastructure Marketing Product Management. During his tenure, Eric helped develop RossGear, GearLite, and the Emmy® award-winning openGear®. Eric has done an incredible job preparing Ross for the future, and I am sure that I can speak for all of us at Ross and those who have worked with him, when I wish him all the best on the next phase of his journey. Stay up to date with all of Ross’ NAB activities! Follow us on Facebook, Twitter, Instagram, and LinkedIn. Through the Lens takes an in-depth look at the trends and technologies affecting the live production industry.